"The result boosts our theory that cosmic rays coming from the Galaxy are directly involved in the Earth's weather and climate," says Henrik Svensmark, lead author of the new report. Sep. 4, 2013 — Back in 1996 Danish physicists suggested that cosmic rays, energetic particles from space, are important in the formation of clouds. Since then, experiments in Copenhagen and elsewhere have demonstrated that cosmic rays actually help small clusters of molecules to form. But the cosmic-ray/cloud hypothesis seemed to run into a problem when numerical simulations of the prevailing chemical theory pointed to a failure of growth. Fortunately the chemical theory could also be tested experimentally, as was done with SKY2, the chamber of which holds 8 cubic metres of air and traces of other gases. One series of experiments confirmed the unfavourable prediction that the new clusters would fail to grow sufficiently to be influential for clouds. But another series of experiments, using ionizing rays, gave a very different result, as can be seen in the accompanying figure. The reactions going on in the air over our heads mostly involve commonplace molecules. During daylight hours, ultraviolet rays from the Sun encourage sulphur dioxide to react with ozone and water vapour to make sulphuric acid. The clusters of interest for cloud formation consist mainly of sulphuric acid and water molecules clumped together in very large numbers and they grow with the aid of other molecules. Atmospheric chemists have assumed that when the clusters have gathered up the day's yield, they stop growing, and only a small fraction can become large enough to be meteorologically relevant. Yet in the SKY2 experiment, with natural cosmic rays and gamma-rays keeping the air in the chamber ionized, no such interruption occurs. This result suggests that another chemical process seems to be supplying the extra molecules needed to keep the clusters growing. "The result boosts our theory that cosmic rays coming from the Galaxy are directly involved in the Earth's weather and climate," says Henrik Svensmark, lead author of the new report. "In experiments over many years, we have shown that ionizing rays help to form small molecular clusters. Critics have argued that the clusters cannot grow large enough to affect cloud formation significantly. But our current research, of which the reported SKY2 experiment forms just one part, contradicts their conventional view. Now we want to close in on the details of the unexpected chemistry occurring in the air, at the end of the long journey that brought the cosmic rays here from exploded stars." Prof. Svensmark and his team are in the Center for Sun-Climate Research at the Danish National Space Institute, DTU Space. His co-authors are Martin B. Enghoff and Jens Olaf Pepke Pedersen. In their paper they acknowledge important theoretical contributions to this line of research, notably from Nicolai Bork of the University of Helsinki. The above story is based on materials provided by Technical University of Denmark (DTU). Measures the effect of ionization on the formation of large clusters (>50 nm). Clusters produced by ionization all grow up to diameters larger than 50 nm. Experimental results contrast previous modeling and theory. In experiments where ultraviolet light produces aerosols from trace amounts of ozone, sulfur dioxide, and water vapor, the relative increase in aerosols produced by ionization by gamma sources is constant from nucleation to diameters larger than 50 nm, appropriate for cloud condensation nuclei. 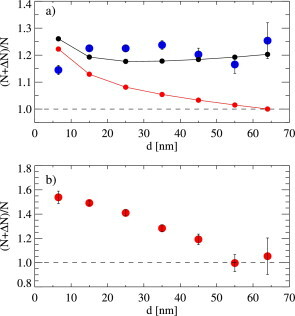 This result contradicts both ion-free control experiments and also theoretical models that predict a decline in the response at larger particle sizes. This unpredicted experimental finding points to a process not included in current theoretical models, possibly an ion-induced formation of sulfuric acid in small clusters. Fig. 1. Schematic diagram of the SKY2 experiment. Fig. 2. During a typical experimental run, number densities of aerosol particles of increasing diameter were observed as a function of time. Left panel: 3–10 nm (black), 10–20 nm (purple), 20–30 nm (dark blue). Middle panel: 30–40 nm (light blue), 40–50 nm (green), 50–60 nm (yellow). Right panel: 60–68 nm (red). 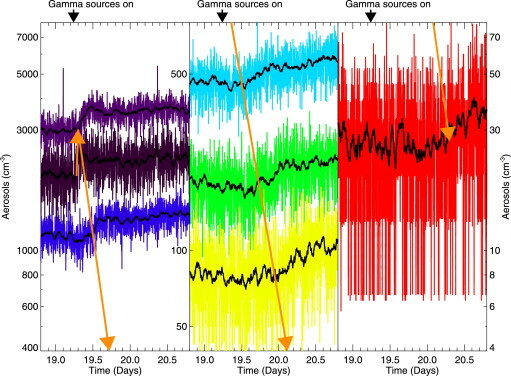 At ≈19.2 days the gamma sources were opened to increase the ionization as described in the text, and an increase in aerosol density began immediately in the 3–10 nm curve (black). Subsequently the increase in number densities slowly propagated down to the larger aerosol sizes, as shown by the slanting arrow. 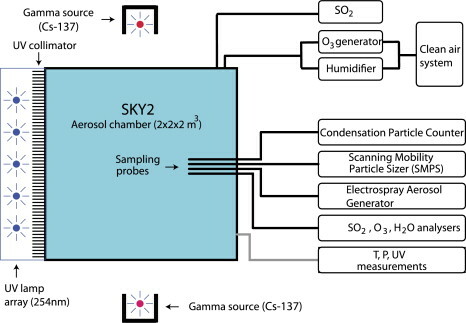 Note that the number of particles in the first bin (3–10 nm) is relatively low because of a lower sensitivity of the instrument to the smallest aerosols. Black curves are an average over 67.5 minutes. Fig. 3. Steady state response to a change in nucleation as a function of particle diameter, normalized to the particle number before two types of perturbation. (a) Ion-induced increase in nucleation. Blue circles are the experimental results averaged over five runs. The red curve is a typical result of a numerical simulation of the experimental situation using a standard numerical aerosol model. Notice that the expected response from the modeling decreases strongly with particle diameter in contrast with the experimental results. A much better agreement is seen with a numerical simulation in the black curve, where the concentration of sulfuric acid is held constant. (b) Control experiment where the increase in particle concentration is done by injection of H2SO4–water ultra-fine aerosols (≈6–8 nm) under constant UV intensity and trace gas concentrations, and no gamma source ionization. Notice that in this case the response (red circles) diminishes as aerosol size increases. Error bars are ±1-σ errors. Where, Oh Where, Has that Global Warming Gone?